If Cyril Wecht were “supreme police dictator,” here’s what he’d do…. 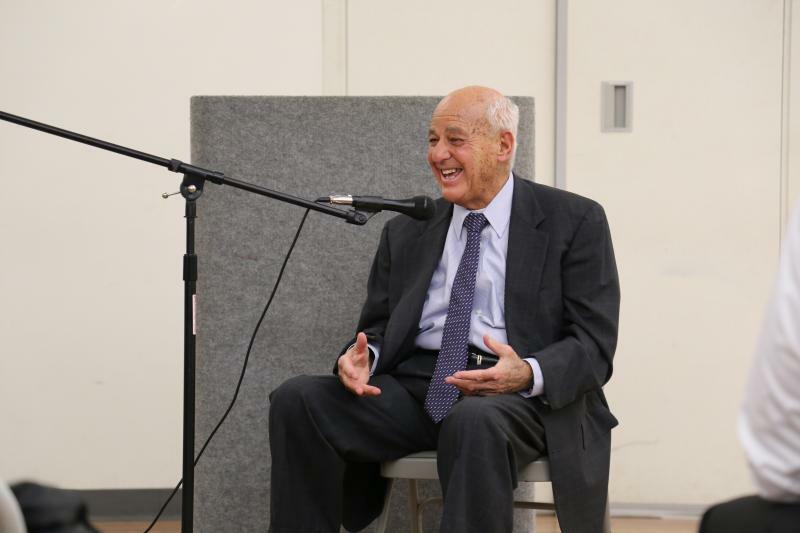 Dr. Cyril Wecht speaking Dec. 7 at a meeting of the Alliance for Police Accountability. Pittsburgh's legendary forensic pathologist Dr. Cyril Wecht has a plan, should he be named supreme police dictator. He’s a blunt critic of the authority-driven, bullish police mentality he describes witnessing throughout his 20-year career as Allegheny County coroner and as a medical expert on a number of national cases where residents encountered police and did not survive. If Wecht were ruling over all law enforcement, he says he would overhaul recruiting to attract officers with stronger education and institute in-depth training that involves lectures and group discussions with community leaders, psychologists, sociologists, judges, retired police officers and – crucially – ordinary residents. This could be the point where a white recruit might for the first time be sitting down for a cup of coffee with a black person, he said Wednesday night at a meeting of the Alliance for Police Accountability in Larimer. As it is now, Wecht thinks it’s all too common for officers to come from all-white communities and be accustomed to the N-word and racial jokes. They go through high school, sign up for the force and get put on the street knowing very little about the residents they’re policing. That supreme dictator position doesn’t happen to exist. But Wecht stresses the need for reforms in response to numerous recent cases, including the deaths of Tamir Rice in Cleveland, Freddy Gray in Baltimore and Michael Brown in Ferguson, and several historic cases in Allegheny County. Among cases Wecht recounted was the death of Jerry Jackson of Hazelwood, who was killed in April 1995 after four officers fired at least 51 shots in the Armstrong Tunnel at the end of a high-speed chase. John Charmo, then a Pittsburgh Housing Authority Officer, fired 13 of the 14 shots that hit him, according to reports. Wecht was not coroner during the shooting, but he told the crowd last night that he reincarnated the case after his reelection using the office’s power to investigate deaths involving police. The investigation involved a recreation of the shooting in the tunnel to pick apart the officers’ explanation that Jackson turned around in the tunnel, which Wecht described as impossible. Wecht said he didn’t think Charmo was charged criminally, though the crowd corrected him. Charmo pleaded guilty to involuntary manslaughter in 2001. Wecht, who lamented that public inquests by the medical examiner have all but been abandoned, also ordered an inquiry into the death of Jonny Gammage, who died in 1995 after an encounter with suburban police. That inquest recommended homicide charges against five police officers involved. Three officers were charged with involuntary manslaughter. The first trial of two officers ended in mistrial after Wecht testified that one of the officers should explain his actions in court. After years of legal battles, the case ended with no convictions and no federal civil rights charges. Last night, Wecht often blasted District Attorney Stephen A. Zappala Jr. for not aggressively prosecuting police. Zappala has helmed the Allegheny County prosecutor’s office since 1998. There is no love lost between the two parties. Zappala’s office had investigated Wecht for possible criminal violations. In 2006, Wecht resigned from his position as medical examiner after a federal grand jury indicted him. The charges, which alleged Wecht had misused his office for personal gain, were dropped by U.S. Attorney Mary Beth Buchanan in 2009. Wecht didn’t address the case last night but gave wide-ranging opinions and quips on key moments in his career, including a visit to the Montel Williams Show, as well as his thoughts on notable recent deaths involving police and the lack of accountability. He described the killing of Walter Scott by former North Charleston patrolman Michael Slager as a “shooting gallery.” Scott was unarmed, fleeing and shot in the back. A South Carolina judge declared a mistrial in the case against Slager earlier this week. Nationally, few police are ever prosecuted when residents are killed. When the police are prosecuted, they’re rarely convicted. For that reason, Wecht stressed the importance of public inquests, which in many cases could be the only fact-finding proceeding the public sees. If murder charges aren’t filed, little information on deaths is revealed to citizens. Civil lawsuits often settle with a condition that the case cannot be discussed publicly. Wecht explained that race is not the sole problem in these cases. Black officers, he acknowledged, have been involved in deaths. And training cannot eliminate all bias, he said, but he underscored the need for more thorough training so officers understand their community and aren’t taking aggression out on residents. In 2016, he’s a bit flabbergasted that so little has changed.